When trying to pick the best value Olympic weight set there are a bunch of things you need to think about. If you are not sure what exactly an Olympic set is you might want to read my previous post on why they are better than standard ones. As a reminder, the key difference is integrity with a heavy barbell (usually 20kg) with a very high capacity, usually 500kg+ whereas standard bars are usually much lower (one I have is 100kg, not enough for deadlifts for most). How much space do you have available for your gym? A classic barbell is 7ft long and therefore you will need at least this width for a full bar, plus space to load/deload the plates. 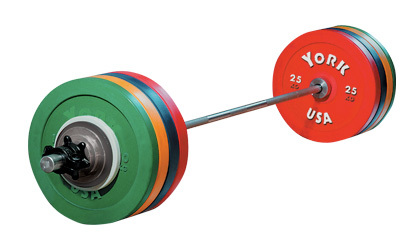 If you’re shy of space, you can get shorter barbells (6ft) which still take 2″ plates. You need to make sure the bar still fits your power cage if it’s shorter, however. Do you want rubber encased Olympic weights? Rubber coated plates look and feel great, especially against their run of the mill iron siblings. The downside? Cost of course! Personally I have iron plates for budget reasons but plan on upgrading to rubber encased Olympic disks in time. The output is usually fairly predictable for most home gym applications in that you want a 145kg, 7ft bar set made of iron for as cheap as possible. We’ll come back to the premium, rubber coated plates in a separate article. Bodymax offers some of the best bang for buck with brand new home gym equipment around, particularly if like me you are based in the UK. The barbell is rated to 1000lb, the plates look nice (originally wasn’t too sure about the hammertone) and each plate conveniently has two handles cut into it. Overall, very impressed with Powerhouse fitness, product is of good quality, the customer service is good, pricing is very competitive, they gave me free delivery and the product arrived within 3 days. Will be ording a Bodyycraft power rack from them as soon as funds become available!